We set out to buy our home 8 years ago. This was going to be the home where we started a family and would live in for a long time. It was going to be wonderful, and organized, and have a beautiful garage where we would do all of our home projects so efficiently. 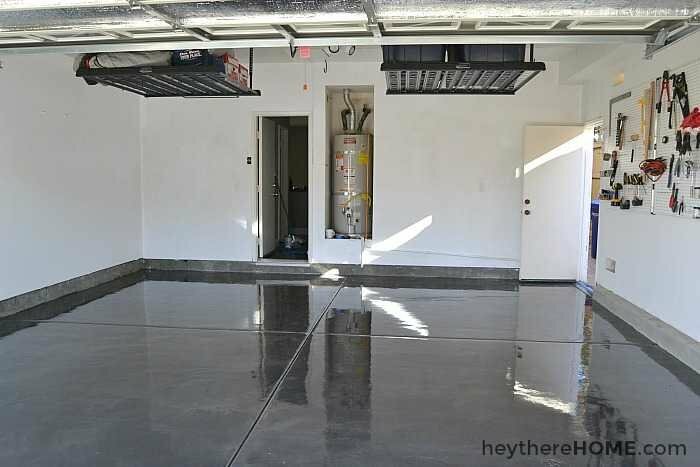 You know a garage with a beautiful coating on the floor, amazing organization, and a place for everything. So we put a lot of time into finding the right home, and planning out how we would make it beautiful and functional. We found “the one”, then found out I was pregnant, and then, because it was a short sale we didn’t actually take ownership until the day after my daughter was born. And even though we gave ourselves 3 weeks to do flooring and paint before moving in, the dream of coating the garage floor before all of our stuff arrived got left behind. We were busy enough with just getting the inside ready to move in, not to mention taking care of a brand new baby. So our stuff arrived, years went buy, we accumulated more stuff, and the garage slowly became a dumping ground. How were we ever going to do the floor now? This post contains affiliate links for your convenience. Click here for my full disclosure. 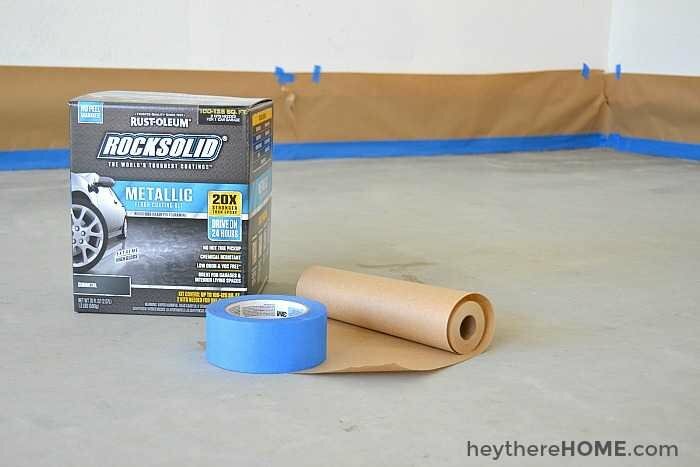 Well, you all know I’m a huge fan of pretty much anything Rust-Oleum so when they reached out and asked me to show you how to paint your garage floor and to try their DIY garage floor coating kit, Rock Solid ®, we pretty much rearranged our entire month and made it happen! This isn’t the first time I’ve dared to show you just how embarrassing some of the areas in my home are. Look at all of that crap! At some point we tried to get organized and got as far as getting some overhead storage and peg board up, but clearly it wasn’t enough. 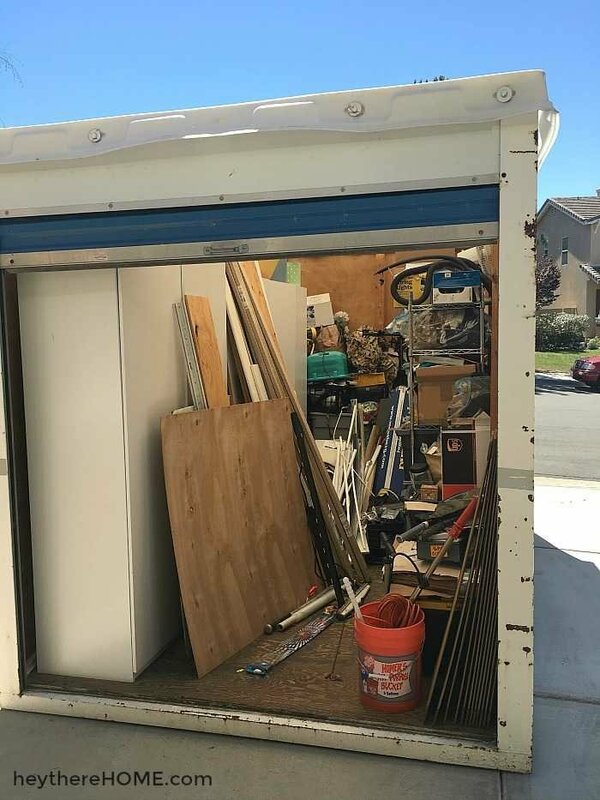 In order to get the garage floor coating down, we had to clear EVERYTHING out, so we had a storage container delivered and out everything went. With everything in the storage container in our driveway we finally had the clean slate we needed to put the garage floor coating down! Here’s a little video to give you an overview of the process, the details with photos are below! The first step was to clean the floor really well. We started by sweeping and vacuuming to remove all of the dust and dirt. Then we scrubbed the floor with water and a little bit of dish soap to remove anything else. Remember we had never parked a car in here so there were no actual oil stains, if there are you will probably want to use something a bit stronger to lift out the oil stains so the coating sticks to your floor properly. Once the scrubbing was complete, we rinsed the floor with the hose and used a squeegee to remove the excess water. You don’t want any puddles of water. 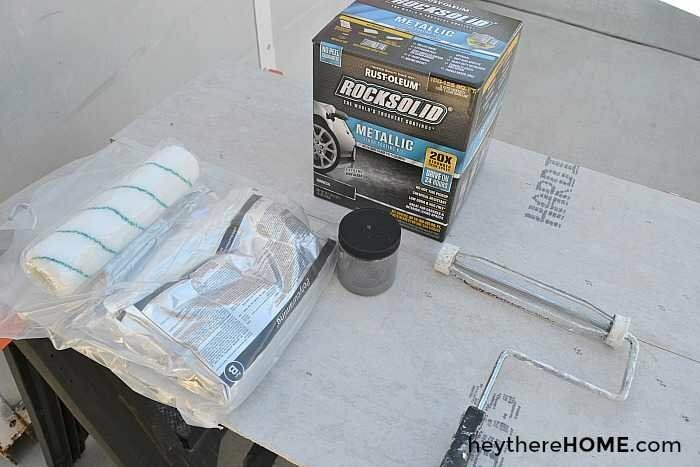 The Rock Solid kit comes with an etching solution that you mix with water and pour on to open up the pores in your concrete. We poured the etching solution onto the entire floor, starting at the back wall and working our way out. You will want to wear a mask and shoes for this part. The etching solution should not touch your skin. We left it on for about 20 minutes and then rinsed with the hose and squeegeed out the excess water. Once the garage floor is etched and dry it will be a lot lighter and almost look powdery, but it shouldn’t actually be powdery. If it is, you will need to rinse again. Now for the fun part! We prepared the area with some paper and painter’s tape. Mixing the garage floor coating was a lot easier than we thought it would be and the kit comes with the roller. Each kit covers about a 10 x 10 area, so for a standard 2 car garage like mine you would need 4 kits. It is pretty thick stuff, so we found that we needed one extra kit to get the coverage we wanted. Again we started at the back wall and worked in one 10 x 10 area at a time by pouring about 3 inch ribbons of coating about 5 feet across. 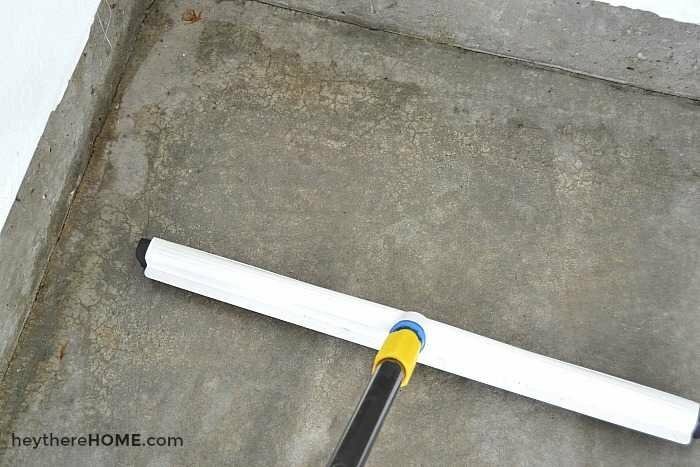 Then move around the coating with your roller in a W pattern over and over again until you have even distribution. I found that it was easier to pull the coating than it was to push it, so when you pour your coating, pour it pretty close to where you left off. Once it’s evenly distributed you go back to the area you just painted and with your roller you lightly rub in a small circular pattern so that when the floor coating dries it has a really cool marble effect. Don’t worry too much about getting it to look perfect. Even the spots I thought would dry weird didn’t and it looks really cool when there isn’t a perfect pattern of circles going on. We left it alone for 24 hours and it looks so good! I think the part that surprised me the most was how shiny it is, but it doesn’t feel very slippery. So excited about this clean slate we now have to get organized once and for all! Looks like my dream of parking a car in the garage before the end of the year might just come true after all!!! We have a ways to go because we promised ourselves that nothing is coming back in here that we don’t need and we have a lot of stuff to go through, but we are thrilled with how the floor looks (and feels) and it’s got us really motivated to get our garage organized once and for all! UPDATE: We did it! We finished our garage makeover! See the final result and all of the DIY organization systems that saved us a ton of money. A big THANK YOU to Rust-Oleum for sponsoring this post. All opinions are 100% my own and I’m happy to recommend a great product like this one. This is BEAUTIFUL! Your garage floor looks like a car showroom. Thanks for posting. Could this be used on a basement floor that occasionally gets damp? Hey Angie, Rustoleum doesn’t recommend using this product where moisture is a problem, although it can be used on a basement floor. See their website for more details. 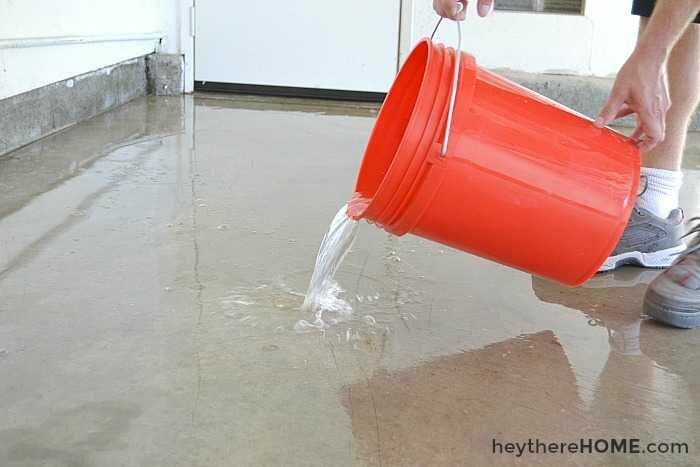 How does the floor maintain grip when wet, for example when it is raining outside and you drive your wet car in and try to stop or go to get out of the car is the floor slippery? 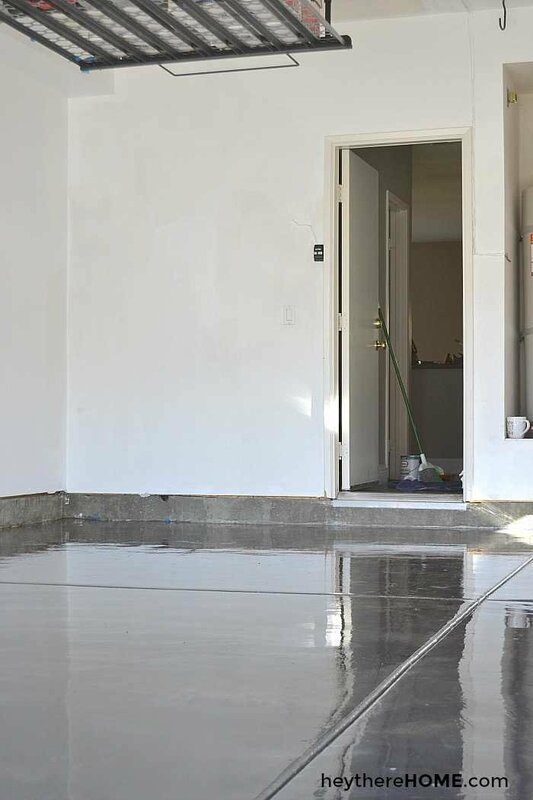 We are going to do the whole house, We have concrete floors now. I can’t wait. How exciting, Viv! I bet yours will turn out awesome! Looks great, wish my garage was that clean. We just moved and the garage floor is super dusty. I’d love a shiny floor like yours! Love your garage floor. I want mine to look like yours! We had similar ambitions for our garage and it’s facing a similar fate to yours. This would be a nice kick in the pants to get us moving! Your floor looks beautiful! Thanks for sharing! I’m sooo dreaming of doing this in our garage someday! I have been wanting to do this for a while but like you, thought I had too much junk in there. Thanks for the post, it makes me think it wouldn’t be so bad after all. We have debated on using a garage paint. It’s such a big project that we seem to keep putting it off. We have three bays in our garage and it would take several kits. I know it would look great. After seeing your results, we’ve decided to just go for it! Thank you for this post! I enjoy a good DIY blog that is realistic (I could ACTUALLY do this! ), honest (having a messy garage), and intelligent writing (yet easy to read). And the result of the project is SHINY! Thank you for the chance to win a very cool prize, too. My cave would look so much better than with the concrete paint that is on now. Love how clean this makes the garage look! 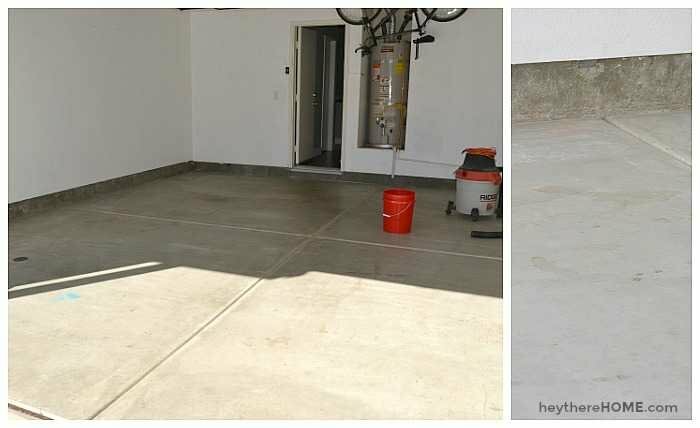 We are moving into our very first home in about a month and I would love to do this to our garage floor! That is gorgeous! I bet I could convince my family to her rid of all their junk in the garage if ours looked this good! I would re-do the floors & create the perfect game room! Complete with pool, air hockey, Foosball, ping pong & darts!! That looks awesome! 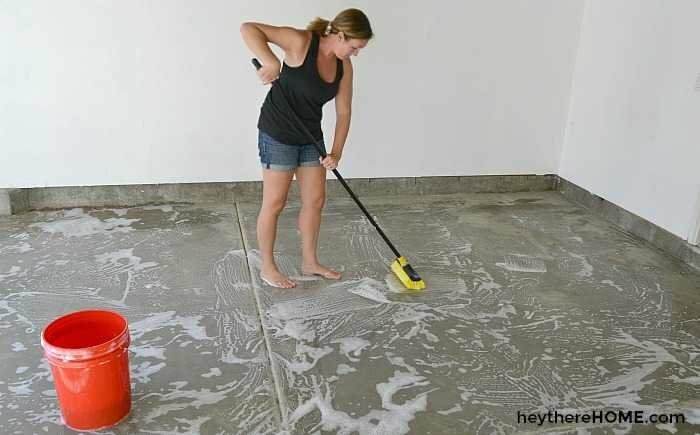 I have always wanted to do something like that with our garage floor, it looks horrible. Here we are 14 years later and it still looks the same. it would look alot better andgive my area a facelift. Looks great! How does it hold up to car tire marks and chipping? Is it durable like expoxy? Thanks for the write up! Would make my garage and storage area so much nicer. I had no idea this stuff existed. 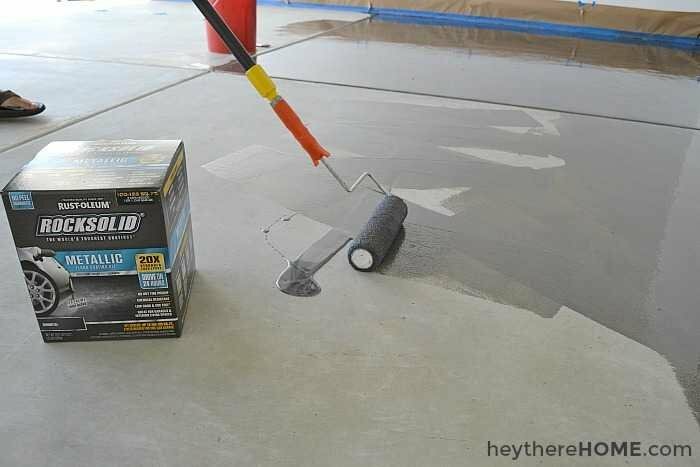 We have been considering just painting our concrete in the garage to give it a fresh look but I now that will just get worn out so quick and need o be redone this looks like a much cleaner, manageable thing to use. Doesn’t just improve the look it is also improving the condition. Also seems fairly easy to do! Very excited to show my fiance! Thanks for the idea! Can I do it on red cement floor. Hi Zeena, I recommend you check with Rustoleum directly. Here is the link to their FAQs. This is magical! Not only does it make the garage floors look amazing it also prevents staining from our leaky vehicle. I would love to win for a family members garage. It has been put thru the ringer over the years & this would give it a new lease on life & look brand new again. It would really be exciting if I could win for them. Thx for the chance to win!! 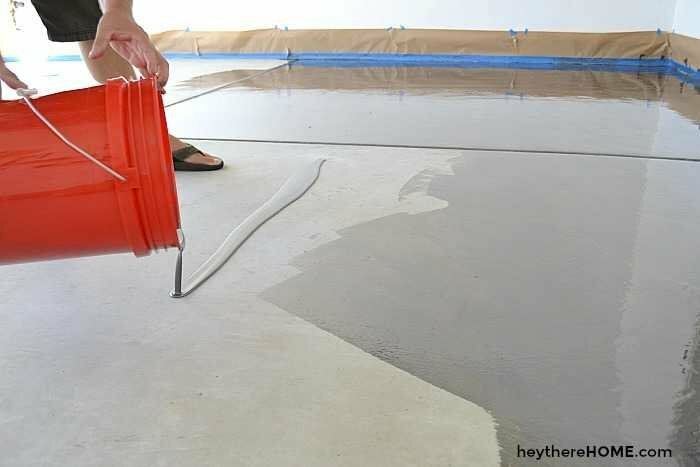 This would be amazing to use on the cement floor downstairs! Thank you so much for this chance! I think it would make the floor look like a dark marble. Very cool! My garage looks like a dungeon! It definitely needs a pick-me-up! Thanks for the opportunity! It looks so shiny! Can’t wait to see what you do with it! 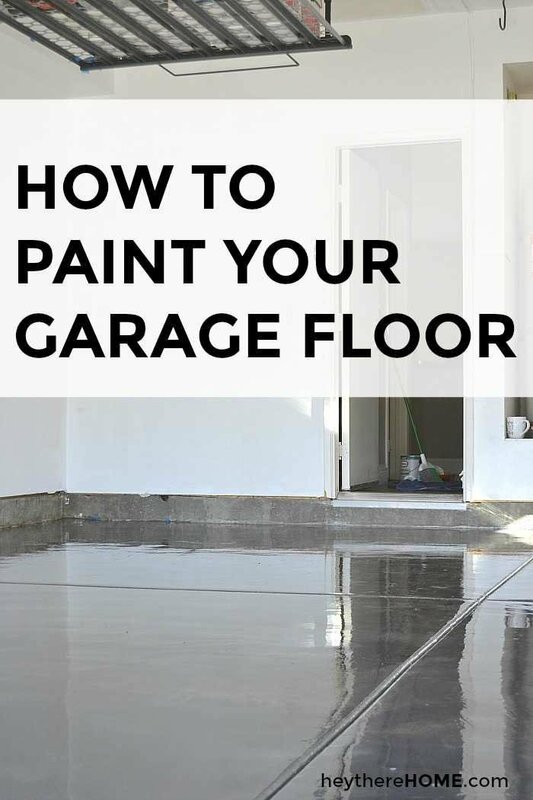 Your garage looks so great with the floor coating! My husband has been wanting ours done for years too. Our garage has a large crack that runs the entire length. We have the crack patched with concrete, but the colors don’t match. This would be the perfect solution to that. We bought an older home with a small garage. This would be a good first step in getting it in working order!! Yours looks great! Great transformation, Corey! Our garage is a huge disaster. I think it’s the next thing on the list when we finish our kitchen! Oh, my goodness. It would change the entire look of the garage, which has some weird something on it from before we owned the house. I have a feeling that, like you, it would inspire some significant organization! I’ve wanted to do something like that since we bought the house. One day! Wow. This would be our incentive to purge the junk. Awesome transformation! My garage looks exactly the same! I can’t wait to see how you organize it! That is amazing! My cave would be kind of a motorcycle theme with lots of chrome. This garage is awesome. Funny how unwanted items end up in the garage. We too have a storage unit outside. Thanks! This is a great idea. We’re buying a house now and this project is definitely on our to-do list. I just hope we actually get it done! That’s so funny I was just talking to my husband last night about making this our next project! I’ve seen it in several other garages and it’s pretty amazing how it makes the floor look brand new and so clean! That’s such a great idea, and so nice looking. I’m so jealous of how awesome that looks!! It would look amazing!!! Looks too pretty to drive a car on!! How would my garage look with Rock Solid- beautiful ! Honey, this stuff would ROCK my already ROCKIN’ car-age!!! Yours looks stunning & NOW I want some too!! I am dreaming of this look for my basement. After my divorce, I saved to buy a home. And my 1930 Craftsman bungalow is perfect. But the basement could use a little love. What a great looking floor! This would be a great incentive to clean out my garage and actually put a car inside. Great job! Perfect timing — we need to seal our garage floor before winter. I dream of emptying my garage and having such a beautiful floor! It is so wild the difference that “Rocksolid” made on your floor! Would love to be able to afford to do this to mine. 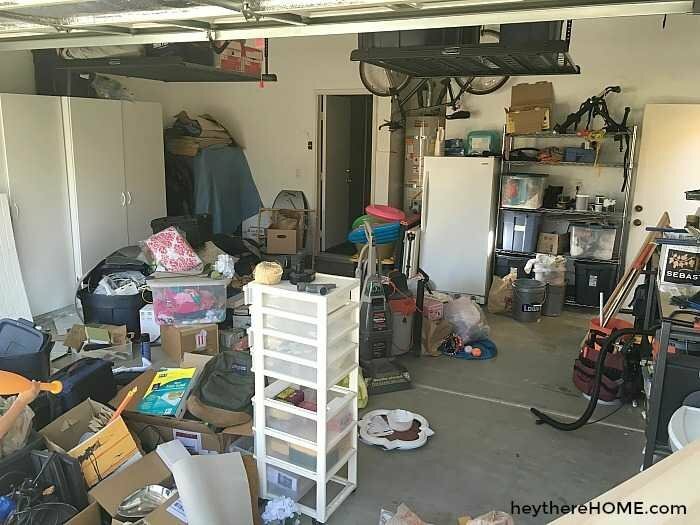 lol we have a garage that looks like yours used to and same thing the floor never got done – this post has made me enthused to get cracking and “DO IT”. This gives me some major motivation to get my garage in shape! Now if I could just get hubby to get rid of stuff! WOW! Will it look the same after parking a car on it? What an incentive to organize your garage, Love it! In the process of downsizing and looking for a smaller one level place closer to our grandchildren. It would be great to have a shiny new garage to drive into every day. Welcome home! I would so love to have a beautiful floor. Rocksolid would give my ‘cave’ a whole new outlook! We’ve had the same cement for over 20 years & it’s def takin a beating over the years! Wow! I want to yank up what I have in my house and just go with the concrete slab. I wish someone would come and put this down in my house – that would be so AWESOME and better than what I’ve got on the floors now! How awesome. Would love for my garage floor to look like that. I really hope I win!! It’s a beautiful garage floor. Love to ship at Home Depot. Those floors look amazing!! Oh so would love to do mine. My garage is not too messy, but is definitely needing a pick-me-up and if would look half as great as your does, I would be thrilled! WOW! LOVE THE GARAGE FLOOR! I’ve seen other products and so happy to hear about this one. We’re in the process of looking for a home in our new town of Astoria, OR. We must have a garage and I absolutely want to have it look like yours. We de-cluttered and downsized so much before moving that a new clean space will be exciting. I too want space for crafting. Nice work and way to go making it a priority! Beautiful floor. Awesome product!!! Thanks for the giveaway. I love home depot!!! My garage could use this for sure! 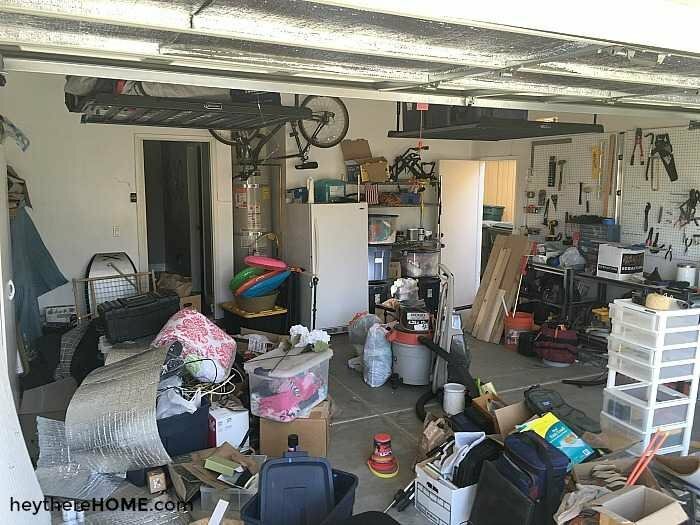 We did this at my daughter’s house–now it’s time for my garage! It would look like a new garage!! My cave would look a lot cleaner.